Whether you're engaging in home improvement or art projects, one of the problems that frequently arises with painting is getting hard-to-remove paint on your hands. Fortunately, there are many effective and safe methods and products to help you remove pesky paint from your hands. 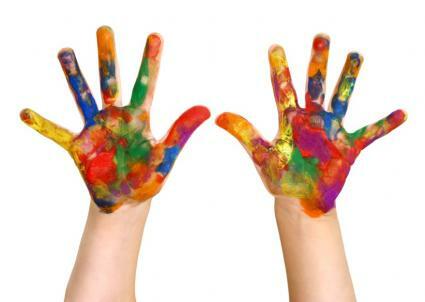 Since the type of paint on your hands makes a difference in the method used to remove it, then understanding which paints are water-based and which are oil-based is important. 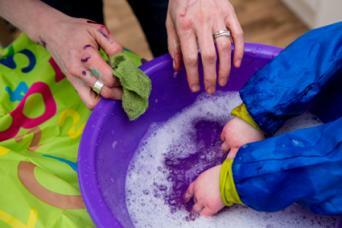 Most water-based paints are washable with soap and water, especially before they've had time to dry on your skin. This type of paint is the easiest to remove from skin, so if at all possible, wash your hands while the paint is still wet. To clean a still-wet, water-based paint, use soap and warm water. Wet hands in warm water. Use a large amount of soap. Rub hands together, ensuring soap covers all areas of paint. If you still have a bit of stubborn paint, then use a loofah or scrub brush and some additional soap to scrub away the remaining paint. Once water-based paints have dried on your skin, they may become more difficult to remove. There are several methods to try. Apply a few drops of mineral or baby oil. Use your fingernails to lightly agitate the area, scraping the paint off your skin. Rinse away the paint flecks. If paint remains, add some isopropyl alcohol to a cotton swab and dab at the paint until it is removed. Apply a teaspoon of mayonnaise to paint-covered area. Allow mayonnaise to remain in contact with paint for two to three minutes. Wipe away with a cloth. Combine equal parts oil and salt. Scrub thoroughly but gently on paint. Rinse away and wash hands with soap and water. Soak a cotton ball or rag with baby oil or mineral oil. Rub vigorously in a circular pattern over the paint. As the paint begins to lift, apply more oil and repeat step 3. Continue until the paint is removed. In stubborn cases, you may need to resort to more aggressive methods. Paint solvents, such as turpentine, are extremely effective, but must be used with caution. When using turpentine, do so in a well-ventilated area away from pets or children. Use a small amount of turpentine to moisten a clean cloth. Dab at the paint with the cloth, remoistening as necessary, until paint comes off hands. 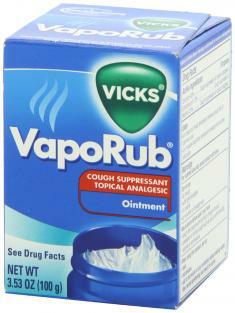 Apply a thin layer of Vapor Rub to areas of paint. Allow to sit for about five minutes. You can also find specialty products designed to remove paint from skin and other surfaces. There is an array of paint-removing wipes available. Users like SoHo Urban Artist Studio Wipes because they are biodegradable and non-toxic. They are also very convenient, effective, affordable, and easy to use. Big Wipes are very effective at paint removal. The wipes have one side that scrubs and the other is soft. They also contain aloe, which provides conditioning for the skin. Some cleansers are specifically formulated to remove paint and other similar products from hands. 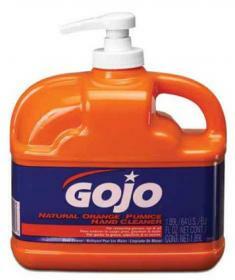 GoJo is a tremendously popular cleanser that removes paint, grease, and other oil-based products. It has a citrus scent and contains mineral oil, which helps dissolve the paint, and pumice, which provides grit to help scrub away stubborn spots. Fast Orange is a lotion hand cleaner that doesn't need water to clean away paint, grease, and other substances. It uses citrus oil for cleaning, and also has skin conditioners such as aloe and lanolin. 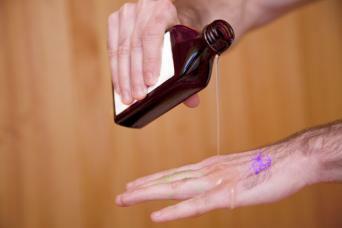 To use it, you pump some on your hands, rub them together, and wipe away the product with a clean towel. Fast Orange also makes a pumice cleaner that combines the dissolving power of citrus oil and the scrubbing power of pumice. While it may take a little more than a simple washing, there's no need to walk around with paint on your hands. Use any of these methods to get your hands clean and paint-free.